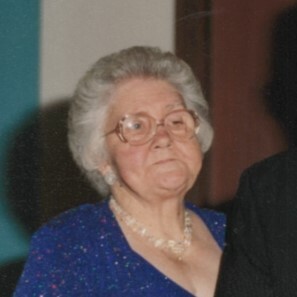 Obituary for Sarah (Maroney) Jones | Thompson-Marodi Funeral Home, Inc.
Sarah “Sally” E. Maroney Jones, 87, of Fallowfield Township, passed away peacefully, Friday, August 10, 2018, surrounded by her children and grandchildren, at the home of her daughter and son-in-law, Kathy and Bob Kyle, where she has been residing. She was born in Ellsworth to the late Richard and Sarah Elizabeth Huber Maroney on April 27,1931. She graduated from Ellsworth High School in 1949. Mrs. Jones had a beautiful voice and sang solo and in the choir at her Presbyterian Church in Ellsworth growing up. She was preceded in death by husband, Mark Yurkovich in 1966 and Ronald Jones in 2012. She is survived by her children, sons, Mark, David (Susan), Leonard (Sherry) Yurkovich and Ron (Marion) Jones and daughters Kathleen (Bob) Kyle and JoAnn (Steve Edwards). Her pride and joy in life was her faith and family. Grandchildren, Jennifer Seleyo (Steve) King, Melissa Seleyo (Wayne Chiurazzi), David (Melanie), Corey (Julie), Ryan (Alyssia), Heather Yurkovich, Tara (Nick) Hydill, all from Belle Vernon, Lindsay (Jose) Sarah (Starlin), Megan (Stephen) and Daniel, all in Los Angeles, Ca. and Jacob and Joshua Jones, California, Pa. She enjoyed family gatherings and cherished her great-grandchildren, Evan Grimes, Dylan and Olivia King, Bradley and Cora Yurkovich, Evalyn Hydil, Audreena and also her LA great-grand kids Kaily, Mia, McKensie, Quinn, Madison, Leah and Luke. Also surviving are her brother James (Lila) Maroney of Tucson, AZ and sister Barbara Playso of Monongahela and many nieces and nephews. Also preceding her in death were brother Richard Maroney, sisters Patty Wilkerson and Carol Gatalica and a nephew Eric Gatalica, two nieces Denise and Christine Siccihitano. Friends are welcome from 3 to 7 p.m. Wednesday at the Thompson-Marodi Funeral Home, Inc., 809 Main Street, Bentleyville, 724-239-2255, where a service will be held at 11 a.m., Thursday, August 16, 2018 with Pastor Andy Scott, officiating. Interment will follow in Mon Valley Memorial Park, Donora. In lieu of flowers, the family respectfully request memorials may be made to St. Jude Children’s Research Hospital, PO Box 1000, Dept. 142, Memphis, TN 38101-9908 or Make-A-Wish Foundation, The Gulf Tower, 707 Grant Street, 37th Floor, Pittsburgh, PA 15219-1916.